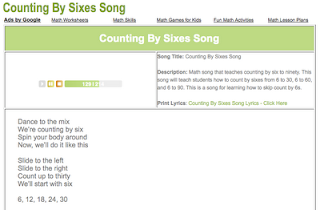 There are many teachers now who effectively use the Counting By Sixes Song from HaveFunTeaching.com. This counting song is a math song that teaches counting by six to ninety. This song will teach students how to count by sixes from 6 to 30, 6 to 60, and 6 to 90. This is a song for learning how to skip count by 6s. This count by six song will help your kids with their multiplication skills. If you would like to listen to more counting songs from Have Fun Teaching, check out the Math Songs page and enjoy!